Are you thinking that I did something fun or that I have a lot to show you after a day's worth of stitching? No such luck! I did spend most of my day stitching. It's just that I have nothing to show for it. 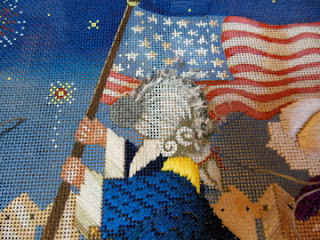 My goal for Saturday was to devote my stitching time to the the July 4th March. What was not in the plan was to rip out everything I had stitched - twice. I wanted to finish up the flag bearer and figured I would spend my stitching time on his wig. Amy's stitch guide calls for a base of basket weave at the front of the wig with a slide bullion curl on top of that. The wig is to be stitched in three colors using long and short stitches or packed outline stitches. First I stitched the wig in the long and short stitches. I only made it half way through the wig before I ripped it all out. Next I tried packed outline stitches and they actually looked worse than the long and short stitches! Those stitches were ripped out as well. I think it's time to regroup on the wig stitches. I may just go with some felt padding and satin stitches as I did with the baby's wig. The slide bullion curls will add a little more interest to it, I think. Whatever I choose to do will come later next week. I need the immediate gratification of stitching my From Russia with Love egg. So that's what will receive my stitching time today. Here's my progress so far this week. 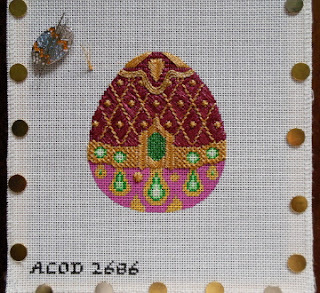 My stitching friend Elizabeth Hurd posted a wonderful photo on Facebook this week of all 12 of her completed eggs. They are so fabulous and she stitched them so beautifully. I sent four of my eggs to The Needle House this week for finishing. I asked to have them finished as standup eggs. Can't wait to see the finished product! Happy Valentine's Day and have a great week ahead! Your eggs are lovely, too! I can't wait to see them come back from the finisher. They were such fun to stitch - I am a little sad now that I've finished them all. Lucky you with 8 more to go! You are an enabler! I just ordered the Russian Eggs from Needle House, Can't wait. Yours all look lovely. Love this egg. They are so beautiful it is hard to pick a favorite. Hope you have a more productive stitching day today. It's the time you can never get back that frustrates me. I hope today was a better stitching day. Shall I give Amy and the girls a hug from you when I see them later this week? P.S. The eggs are gorgeous!